I created this website as a resource for new parents who were interested in babywearing. Sometimes I get emails pitching baby carriers that are made overseas. When I look at them, they sometimes look like they’re knockoffs of the usual “major” brands like Ergobaby, Tula or Beco. You can find knockoff slings and soft-structured carriers (SSCs) on Amazon and other online stores. Many times I’ll notice they are made from China and I can’t find a corresponding website to look for more info. I don’t actively promote these off-brands because I don’t know if the manufacturer or business are familiar with BCIA guidelines. I don’t know if they follow guidelines laid out by organizations like US Consumer Product Safety Commission, Baby Carrier Industry Alliance (CIA) or even Babywearing International. The BCIA and BWI are nonprofits geared to help the public with carriers, slings and wraps and such. The US CPSC is a federal entity that reviews products and protects the public from unreasonable risks of injury or death from all kinds of products. Of course, you are the boss of your family. You decide on whether a product is right for you and your child. There may be some great small businesses (woman-owned! yeah!) that produce a really awesome baby carrier or sling. I am not the all-knowing Oz, so I appreciate your help in showcasing great smaller brands! I choose not to actively promote off-brands from overseas that look questionable to me. If I’m unwilling to put my baby in it, why would I promote it for yours? Thanks for understanding my point of view. 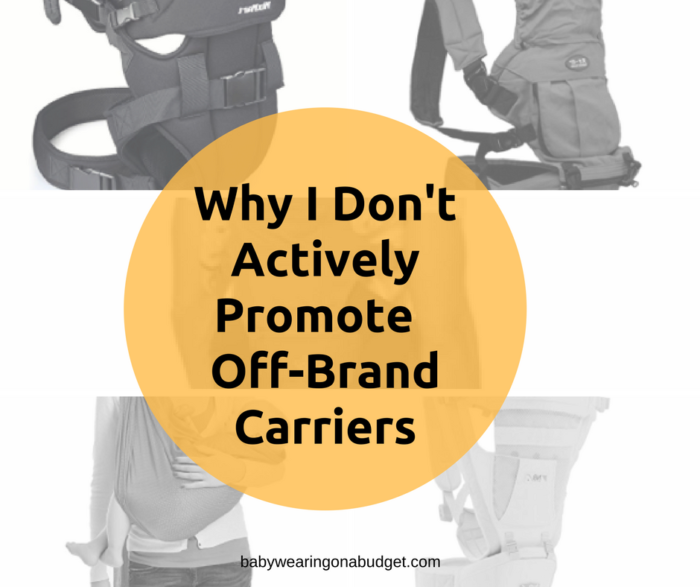 If you’ve had experience with a non-major brand and recommend a carrier or sling or wrap, please drop a note in the comments! Share your thoughts.